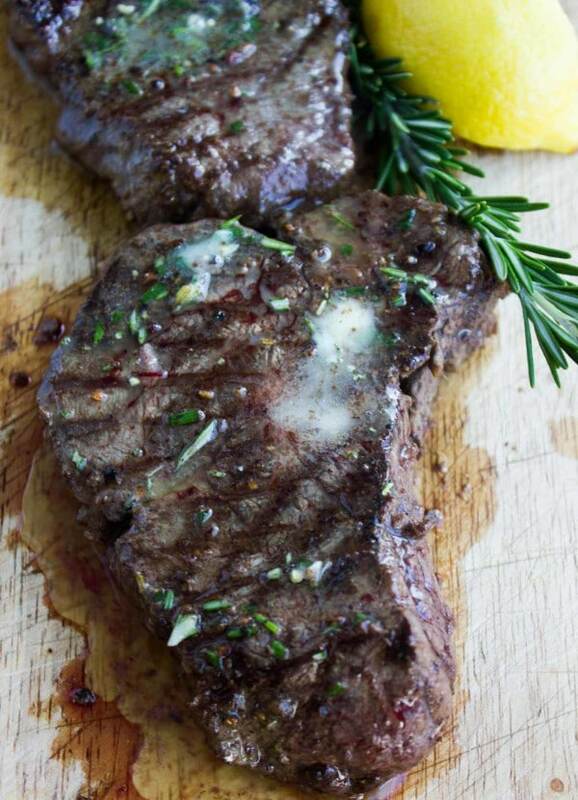 This grilled steak with rosemary lemon butter is the way to go for all steak lovers! Juicy, flavorful and perfectly grilled pieces of tenderloin steak covered in lemony herb butter for ultimate flavor. The best steak you will ever have, ready in 20 minutes! 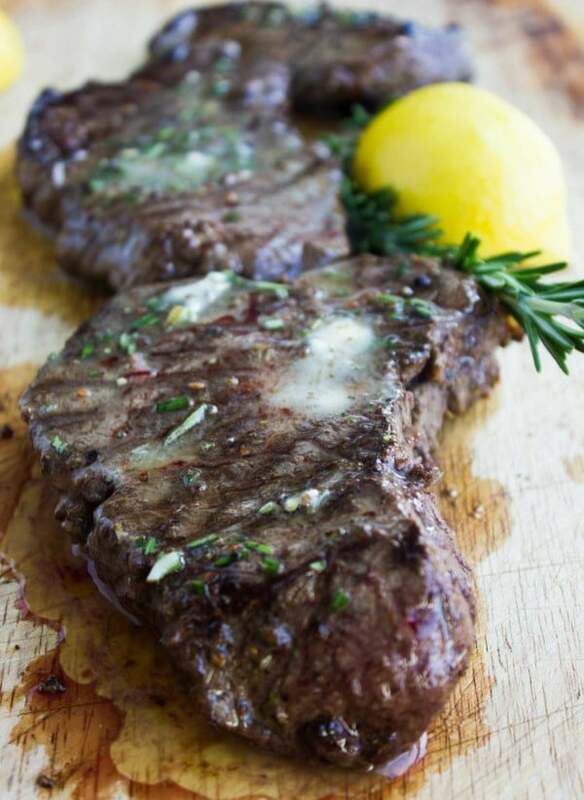 This grilled steak with rosemary lemon butter is a must-try for all steak lovers! 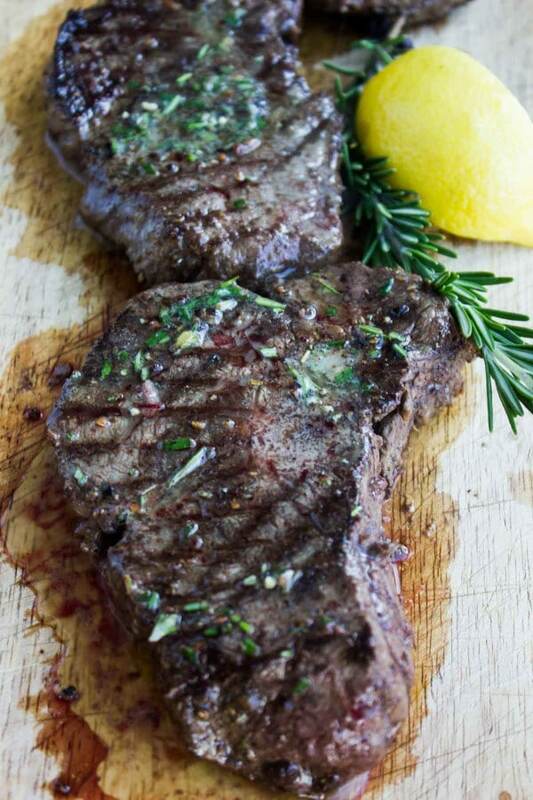 Juicy, flavorful and perfectly grilled pieces of tenderloin steak covered in lemony herb butter for ultimate flavor. The best steak you will ever have, easy and all ready in 20 minutes—save that trip to the Steakhouse today! You will definitely not regret it. The perfect steak is one of my favorite things to eat and make, and if you agree to that or have a special person in your life who’s also a steak lover — then here’s some good news :without a doubt, a steak done right at home, is the best steak you’ll ever have. Note, that this is coming from a person who had her share of steaks at fancy restaurants! So before you think I’m talking this one up, just take a look at this simple rustic beauty of a steak! My brother is a die-hard steak lover, so is my dad, my husband, some close friends, my brother in law, and many more people in my circle, I suppose. But I will mention my brother because he’s a foodie and always used to ask me for easy fool-proof recipes back when he was living on his own for a while during his college years. 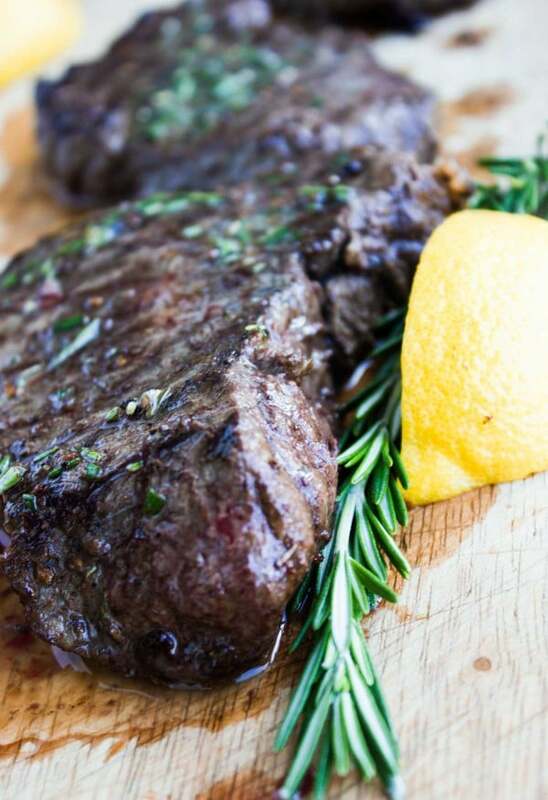 I convinced him to dare himself and make this simple rustic grilled steak with rosemary lemon butter—and he did it! Now he competes for the steak master title among his buddies! Obviously, the perfect steak starts with the perfect steak cut! There’s no way around it. But the best thing is, it’s totally a matter of taste, so whether you go for an NY strip, rib eye, or sirloin steak- all is good if that’s your taste. My personal favorite is tenderloin, aka. filet mignon. If you feel you’re not sure which steak cut to pick, by all means, start with the tenderloin too. ultimately, it’s utterly juicy and tender. Moving on to seasoning: steak, salt and pepper are fine, but a touch of onion powder and dried rosemary really elevate the flavor without overpowering the “beefy” taste you want. The steaks are perfect cooked on the grill or on a stove top grill pan (as it ends up being the case for most of our cold months here). Depending on the size and thickness of your steak and on how rare you prefer it, you will need to adjust your cooking time. 9 minutes per side is the maximum cooking time you’ll ever need—most steaks vary between 4-8 minutes per side. And as tempting as it may be—don’t taste the steak right off the grill, it’s best to let it sit for 2-3 minutes before serving so the juices stay in the steak do not run all over your plate as soon as you cut into it! A word about the butter: I really can’t stress on how this tiny bit of butter can make all the difference to your steak. The idea is not to add fat to your steak or drench it in fat, you won’t need more than half a teaspoon ( maximum 1 teaspoon) of this butter mix on each piece of steak. Once this herb-infused butter is dolloped on top of the hot steak, it starts to melt and quickly covers the whole piece of meat, adding a little extra juiciness, a lot more fresh herb flavor – simply the perfect final touch to it! Adjust the cooking time to your preferred cooking grade, starting at 4 minutes per side for rare and going up to 8 minutes for well done. Don’t go higher than 9 minutes. 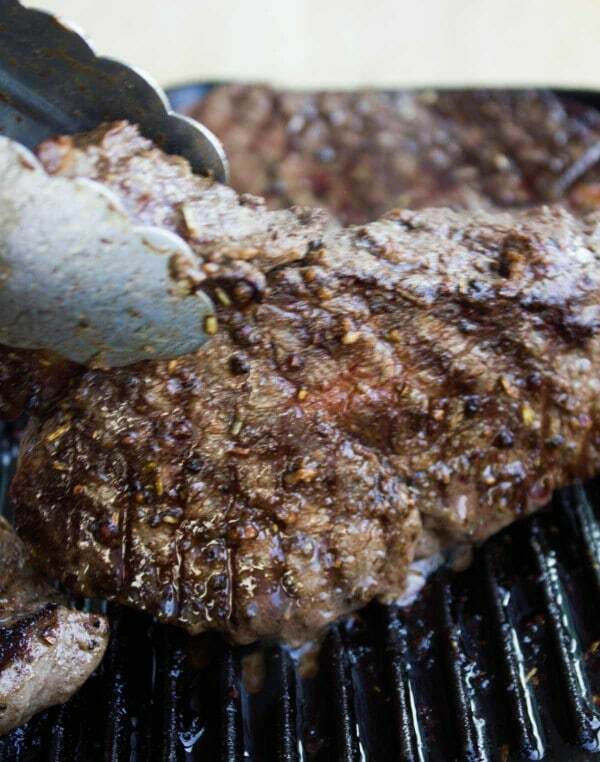 Let your steak rest after grilling to give the juices time to settle. Serve these steaks with a dollop of herb butter to take them to the next level. 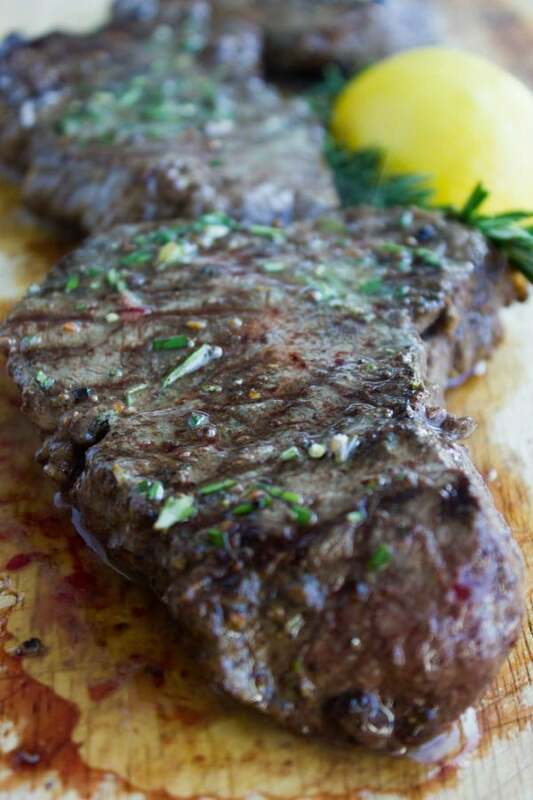 This grilled steak with rosemary lemon butter recipe is the way to go for all steak lovers! Juicy, flavorful and perfectly grilled pieces of tenderloin steak covered in lemony herb butter for ultimate flavor. The best steak you ever had, ready in 20 minutes and better than at your favorite steakhouse! Preheat your grill or grill pan to medium-high heat. Season the steak pieces on both sides equally with the salt, pepper, onion powder and rosemary. Place the steaks on the grill and do not be tempted to flip for at least 5 minutes until it has a nice sear on that side. Flip the steak and lower the heat to medium, then cook for an extra 6-8 minutes depending on how well you want your steak and how thick it is. Let it cook longer for medium well-up to 10 minutes. Flip the steak back and turn off the heat. Place half a teaspoon (or more up to your taste) of the butter mixture on each piece of steak. Then put the cover on (if using a grill) or aluminum foil (if using a stovetop grill pan) to cover the steak pieces loosely for 2-3 minutes. Serve the steak with extra butter if needed. Adjust the cooking time to your preferred cooking grade, starting at 4 minutes per side for rare and going up to 8 minutes for well done. Don't go higher than 9 minutes. We too are steak eaters and couldn’t wait to try this out immediately. I tried this and it was scrumptious – made it twice, two days in a row :o). 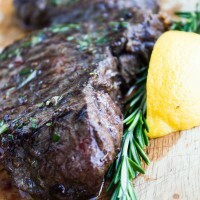 The rosemary gave the steak a wonderful flavour and the rosemary lemon butter spread melted on top was so flavourful. All I can say is, THANK YOU, Mahy for this recipe idea! It’s like dining out at ‘Ruth’s Christ Steak House’ at home. 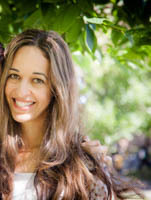 Ali, thank you for your comment!You made my day:) Enjoy!